Congratulations to our new Mr. New England Rubber 2018 Noah Von Ark (Pup Gear)! 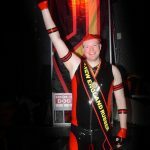 Big thank you to the Providence Eagle for hosting us, Invincible Rubber for donation of our new sash, as well as our judges, volunteers, and all of the shiny rubbery people that came out to support the contest! Copyright 2014-2015 - New England Rubber Men, Inc.